A woman has told of her anger after she was slapped with a €120 clamping fee in Dublin, despite having a disabled parking pass clearly on display. Ita Doyle uses the pass when travelling with her 86-year-old mother and was shocked to see her car clamped despite its presence. After calling the security company to appeal the hefty €120 fee, Ita was told to make her complaint in writing and was left with no option but to pay the money. The fee also included a €5 processing charge added on. Ms Doyle was parked in a disabled parking space at the Northside Shopping Centre for just under an hour when she returned to find the car had been clamped. She claims the parking pass was clearly visible on the driver's side of the car, just beside the wing mirror. Ita's daughter Tricia was forced to collect her elderly mother, who was very upset at the situation. "If I was illegally parked, I would put my hands up and accept it, but the pass was there for all to see," Ms Doyle said. RFC Security Group oversees the clamping of illegally parked vehicles at the shopping centre. 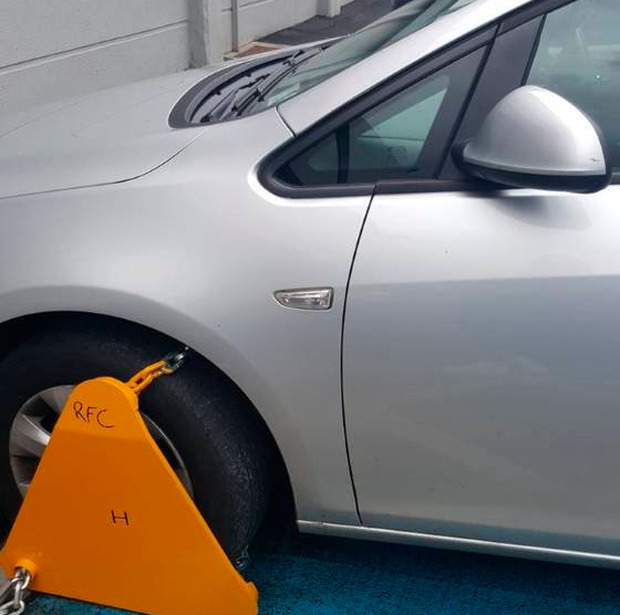 When contacted by the Herald, an employee of the company said they had "photographic evidence" the parking pass wasn't displayed at the time the car was clamped. However, Ita claims this wasn't the case, and added: "I don't know if they are insinuating I put the pass up afterwards and took a picture, but the sticker was on the driver's side when we left the car." She is now calling for the €120 fine to be overturned, but says she will have to wait until today to speak to a manager at RFC for further clarification on the matter.